On Saturday January 28th the Choir joined folklorist and singer Margaret Bennett in her “Auld Lang Syne” concert at Celtic connections in the Royal Concert Hall in Glasgow. 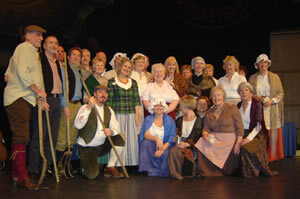 Dressed in 18th century peasant costumes, the Choir accompanied the internationally-renowned musician in her acclaimed production, For Auld Lang Syne, a musical appreciation of the life and works of Burns scripted by Margaret Bennett, with musical direction by guitarist Sandy Stanag. Margaret invited the choir to join the production after singing with them at the Pearls of the Tay opening concert of Perth Concert Hall.